My company, Universal Head, is 14 years old today. In commemoration of this event I looked through my archives to dig out a really old design. This is the ‘Sweating Mac’, an illustration I did way back in 1989, and one of the first illustrations I did just after learning how to use Adobe Illustrator 88 (as it was called back then). As primitive as it looks today, this got me a lecture spot on a big Desktop Publishing Conference at the time, which was pretty exciting for a designer fresh out of college. 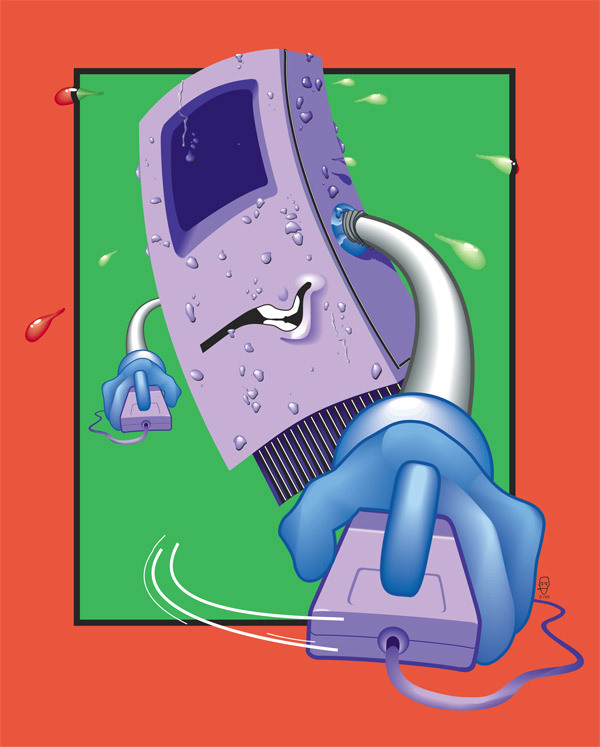 Not many people were doing illustration work with computers yet, so this was pretty revolutionary stuff. Here’s to the next 14 years! If you’re interested, the Universal Head site is here. Congratulations, man. It’s not easy to succeed on your own in this business, but you’ve definitely made a mark. Congrats, Pete. Even from 14 years ago that’s a pretty sweaty, I mean sweet, illustration. Yes, been a bit quiet around here lately, hasn’t it? Ironically enough, we just had a discussion about how designers rarely notice typos in their work. Quite around here, indeed ;). You did it again 🙂 HA! Haven’t you got some work to do?